These exercises for sacroiliac joint pain are meant as "quick fixes." They will help it naturally "drop back into place" so you can be out of pain. ***The main SI Joint Pain page in the navigation bar to your left should also be done in conjunction with this page. Your S.I. Joint….like a gear that is been pulled out of place….hurts when it's not in the right position. These exercises are designed to let the joint slip back into the position it naturally wants to be in. Just follow along with the videos below, and you'll do fine. Video 1, Video 2, Video 3 . Your S.I. Joints are the two dimples on your lower back where your two hip bones (ilium) attach the upper sides of your tailbone (sacrum). 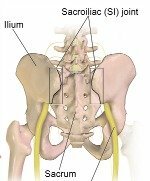 *** On the Main Sacroiliac Joint Pain Relief Page we release all the muscles that attach to your pelvic bones and tailbone, these are the bones that make up your s i joint. I show you, step by step, how to release the muscles in your thighs, hips, inner pelvis, etc. that get tight and pull your s i joint out of place. When used in conjunction with these exercises for sacroiliac joint pain relief shown below, it's not only a great formula to get out of pain….but even better….it's a formula to stay out of pain. Important - FEEL FREE TO ONLY WATCH THE VIDEOS AND FOLLOW ALONG WITH WHAT I DEMONSTRATE. The text is there to support the videos if you need more clarification. A. This exercise for sacroiliac pain is the simplest of all. Take your middle finger of the hand on the same side as your s i joint pain and locate the bottom tip of your tailbone. Move your finger approximately 1 inch toward the side of your pain and hook your middle and ring fingers under the soft tissue there, so you're creating upward pressure on that side of your tailbone. Now, as you gently pull upward, pressing the heel of your palm approximately toward your belly button. Your pressure should upward and forward. Be gentle but firm. Now walk ten paces paces forward, turn, and take ten more paces to return to your original spot. All this while maintaining the "upward and forward pressure" with your fingers and hand. Like all the exercises for sacroiliac joint pain relief on this page, test the effectiveness of this one by alternately standing on one leg. Now repeat the exercise with the other hand and then assess the level of pain relief. Assess overall how effective this exercise for sacroiliac joint pain has been for your body. B. If your pain is unchanged or worse, try only pressing with the heel of your hand in a "forward and downward" direction as your walk a total of 20 paces on each side. Then assess how effective this exercise for sacroiliac joint pain has been for your body. A.Lie on your back, raise one knee (on the painful s i joint side to start) while keeping your foot flat on the floor. Very gently drop your raised knee over your opposite leg and let it rest at whatever level it's comfortable. Take your hand from the same side as the leg that is bent and place it on your tailbone. Take your index and middle finger of the hand on the same side as your s i joint pain and locate the bottom tip of your tailbone. Move your fingers approximately 1 inch toward the side of your pain and hook your fingers into the soft tissue and gently pull upward while pressing your palm approximately toward your belly button. Your pressure should be gentle but firm. Now, while maintaining the pressure with your hand,in one smooth gentle motion roll back over onto your back and straighten your leg. Repeat this procedure on the other side of your tailbone. Assess overall how effective this exercise for sacroiliac joint pain has been for your body by alternately standing on one leg. B. If your pain is unchanged or worse, try only pressing with the heel of your hand in a "forward and downward" direction as you twist, apply the pressure, and then role back onto your back while straightening your leg. Lie on your back with your knees bent and your feet flat on the floor. Now, alternately tuck the tip of your tailbone upward and then pull the tip of your tailbone downward by arching your back. Do this a approximately 20 times. Lie on your back and raise your bent knees toward your chest until they're perpendicular to the floor. First, with your hands about 4-6 inches apart, put your hands between your knees and push outward with your hands and your push inward with your knees. Do this for about 3 seconds. Second, with your knees about 4-6 inches apart, put your hands on the outsides of your knees and push inward with your hands. Do this for about 3 seconds. Alternate, these two motions until you've done 5 sets total. Repeat the above exercise with your knees 1 foot apart. Repeat this exercise with your knees 2 feet apart as wide as possible for your body. Then assess how effective these exercises for sacroiliac joint pain have been for your body. C. Resisted Bicycle Motion Lie on your back and raise your bent knees toward your chest until they're perpendicular to the floor. First, with your hands about 4-6 inches apart, hold one knee from the front (the side closes to your shin) and the other knee from the back (the side closest to your thigh). With each knee always being held in the opposite knee from the other, alternate pushing your knees into your hands. Do each rep for about three seconds, switch your hands to the other side of the knee their holding, then repeat. Lie on your back with one leg straight and the other bent with your foot flat on the floor. Allow your bent knee to fall over your opposite leg while turning the shoulder on the side of your bent leg in the opposite direction from your bent leg. Gently push into the stretch and feel for tension that you can access while stretching. You may feel a "pop" as your s i joint falls back into place. Repeat this entire sequence on the other side of your body. Repeat this entire exercise as often as you desire. It's a great stretch and it generally feels good! In this exercise it's usually ideal to have the bottom leg held out straight. While chatting with you on the video my lower leg is a bit bent, which makes the technique a bit less effective. Assess how effective these exercises for sacroiliac joint pain have been for your body. 2. Lying on a Wedge Lie on your back with your legs straight. Take one of your sneakers with a folded sock inserted into the toe area, and place in under the s i joint that in pain, and relax in this position for 5 to 10 minutes. You want to feel a bit tilted as you lie on your back from the gentle pressure of your bodyweight on the tip of the sock-filled sneaker. Repeat this procedure on the opposite side. 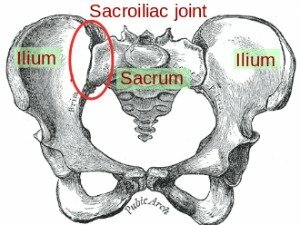 Visit the main Sacroiliac Joint Pain Relief page to learn techniques and tips on how to release your s i joint pain on a deeper level, so it's less likely to happen again. Visit the main Lower Back Pain Relief page where you are shown the 3 Simple Steps to relieve your lower back pain.